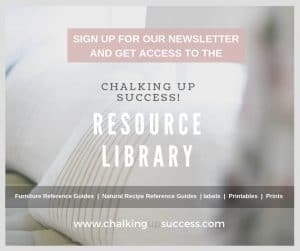 5 Affordable ways to improve your outdoor space - Chalking Up Success! 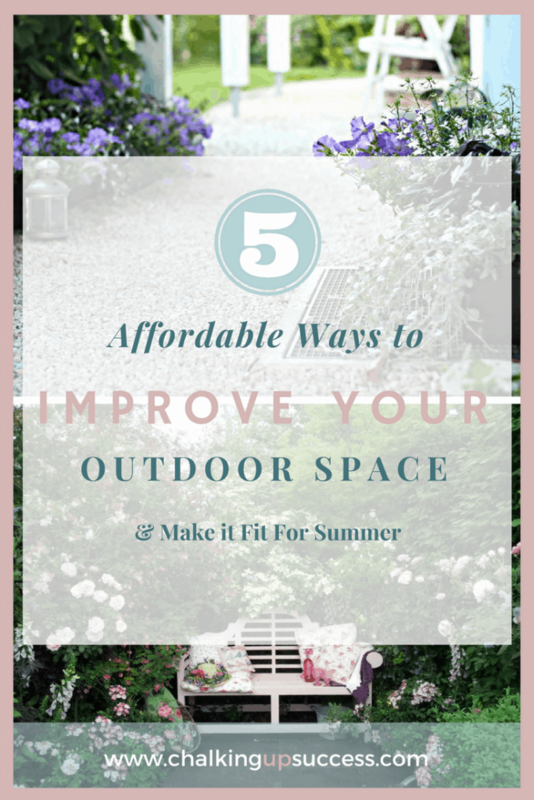 5 simple ideas to give your outdoor space a boost for summer without breaking the bank. Because we have such long cold winters here in Bavaria, we really like to make the most of our outdoor space during the warmer months. As soon as the sun breaks through the clouds and the garden starts exploding with life and lush greenery, I can’t wait to start prettying up our sitting area. I know this area is going to be well used over the coming months and I have a few tricks up my sleeve for adding a little style without having to spend a fortune. Maybe you like to fill your summer evenings with gatherings of family and friends or maybe your outdoor space is a haven of tranquillity just for you to relax in after a long day at work. 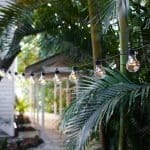 However, you like to use your outdoor space, here are a few ideas that are guaranteed to make you want to spend more time outdoors this summer too. 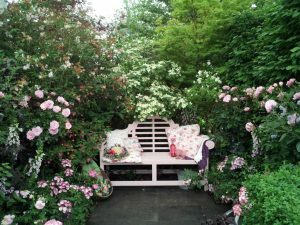 If you have space, plant some scented plants around the edge of your sitting area. Every time someone brushes up against them the perfume will be released into the air. 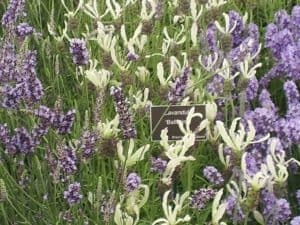 Some plants like lavender or lemon balm also help to drive off pesky mosquitoes so you get two for the price of one. Don’t have any planting space? No problem, just pop the plants into pots and display them around your sitting area. Three or five pots of varying sizes grouped together will make more of an impact than single pots placed all over your outdoor space sitting area. Just make sure that you choose pots that are big enough for the plants so that the roots don’t get parched in the heat. Make sure you check them regularly and top up with water if required. If you don’t want to worry about watering every day, buy simple water spenders for your pots or use water saving crystals mixed in with the potting earth. Make the most of a small outdoor space by planting herbs. Not only do they have a lovely fragrance but if you often cook outside in summer, they’ll always be on hand when you need them. Need to screen off an area for privacy? Climbing plants are a great solution. 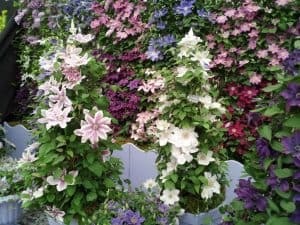 You will need a larger pot, especially for clematis as they like to keep their roots cool. Make a rustic climbing frame with sticks to keep the costs down or, if your budget allows, buy a ready-made frame. 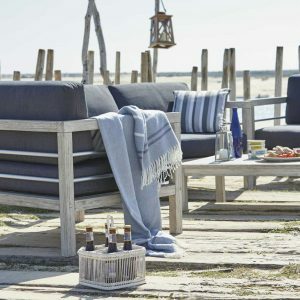 Cosy up your outdoor space with some cushions and throws. You’ll be able to sit out longer and enjoy the fragrant air when the evening chill rolls in. Drape some throws over chairs so that they’re on hand for you to cocoon yourself as the sun goes down and the stars come out. This lovely coastal stripe throw from John Lewis Retail is washable at 40° which is something I always look out for. It’s nice and thick too which makes it a versatile all rounder! Floor cushions like these Kilim Cushions are also a great solution for when you need extra party seating and can be used indoors too. 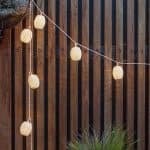 This is my favourite way of prettying up my outdoor space. 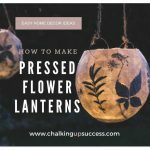 Candles and lanterns can make for an enchanting space. Citrus scented candles will also help keep your seating area free of mosquitoes. All of the lights and lanterns below are from lights4fun which is one of my absolute favourite online shops. 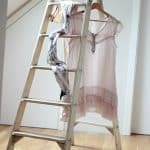 I always shopped the UK store but now they also have a German site which is a major plus! Nothing says ‘party’ more than festoon or circus lights. 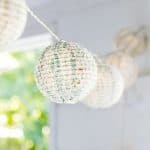 String them around your sitting area or drape them through trees. 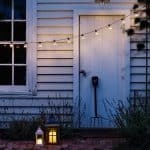 Don’t want to splash out on new lights? 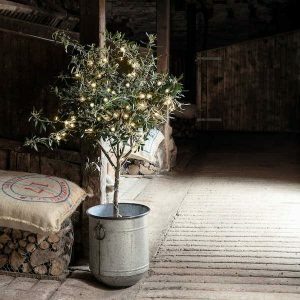 Just use your Christmas fairy lights. Who says they can only be used at Christmas anyway? Is your terrace more of an eye-soar than a sight for sore eyes? Maybe you inherited ugly concrete tiles or slabs from the previous homeowner. Maybe your wooden deck is chipping and peeling but you haven’t got the time or the money to fix it just yet. 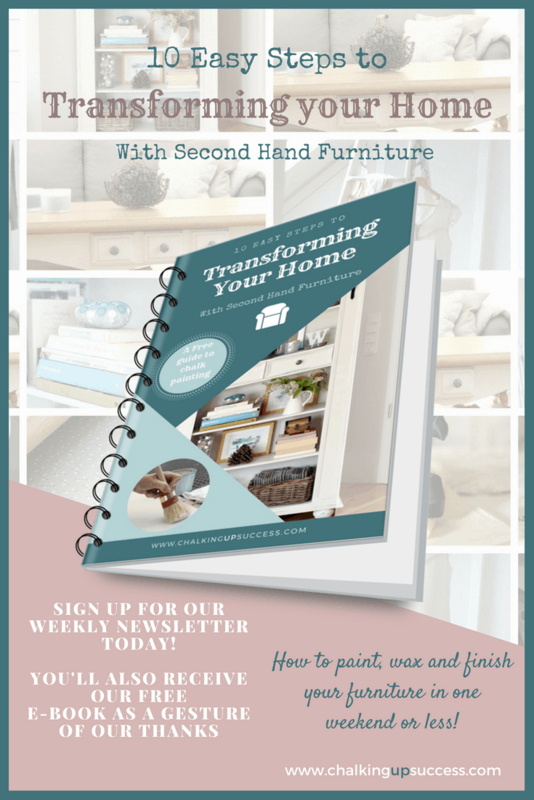 Here are a few tips for making a temporary fix until you are able to renovate or for when you’re in a position to replace the ugly with what you really want. This can actually look really stunning and you may even consider keeping it once you see the difference it makes. Obviously, this works best if the concrete is in good condition, without large cracks or holes. It’s really easy to apply (I actually painted the whole of our cellar floor with this when we first built our house. We couldn’t afford to tile that space right away but needed something to cover the concrete and contain the dust – we finally replaced it with tiles around eight years later). If you don’t want to go down the paint route, you could always cover the ugly with a rug. Gone are the days when the only outdoor rugs you could find were made of horrible plastic and felt icky underfoot. These days there are so many lovely designs to choose from. Most can be used both indoors and outdoors and have the feel of real carpet. These are perfect for covering up an ugly terrace floor. They also help define the space and create a more intimate and cosy atmosphere. Again, it’s always a plus if you can easily wash your rugs which is why I love this Weaver Green Provence Collection from John Lewis Retail. These gorgeous reversible rugs are made from recycled plastic bottles – how amazing is that? They look and feel like wool but are waterproof, mould resistant and washable. For more inspiration, read this post about outdoor rugs. 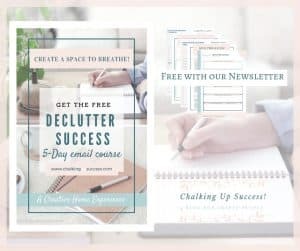 You’ll need to roll up your sleeves and get a little bit crafty for this one but if you’re on a really tight budget, or you want something bespoke, this might be the perfect solution for you. If you need it to be a bit more robust you can buy some non-slip carpet backing and sew or glue it onto the back of the cloth. 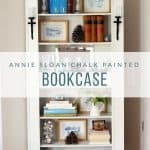 I love this idea simply because you can create something really unique for your space. 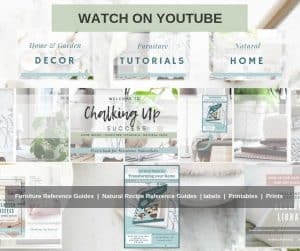 Take a look at this tutorial for some inspiration. Water features don’t have to cost a fortune. 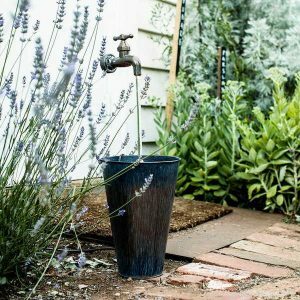 A simple water fountain in a tin bucket or container filled with pebbles can look and sound great tucked in amongst your plants. You’ll also have space on your balcony for a mini water feature like this. There are also plenty of solar models available so you don’t even have to have an electricity supply. 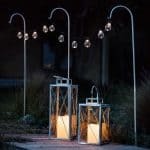 The fun Zinc Garden Fountain below is from lights4fun UK but for a European electrical connection you’ll need lights4fun DE or FR. I love this easy DIY water fountain tutorial from Anne of On Sutton Place. 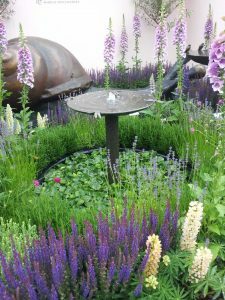 Bird baths are also a pretty feature and you will be doing our feathered friends a favour too if you decide to place one of these in your garden. 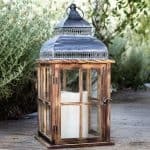 This Etsy shop Londongardentrading caught my eye with these gorgeous copper birdbaths. If you buy one on a long stem, the birds can bathe safely away from cats or any other predators. Place it in view of a window so you can watch the birds enjoying the lovely bath you’ve made for them from inside too. When our old washing machine gave up the ghost, we saved a side panel to use as a bird bath. We love watching the birds and all their hatchlings splashing about in the water in the early mornings! The more birds you can encourage into your garden the better. They eat pests like greenfly and so help to keep your garden plants healthy. Are you feeling inspired yet? I know I am and I can’t wait to get started. I’ve been wanting a water feature for the longest time, maybe that will be my project this year. What do you do to cheer up your outdoor space for summer? Pass on your tips in the comments below I’d love to hear them. Tried to add myself to the mailing list but wouldn’t accept me.. So sorry about that Laurie-Anne. If you email me with the details of which sign-up form you tried to sign up with and the error notice you received I’ll check that for you. Alternatively, you could try using another form on the website to see if that helps.